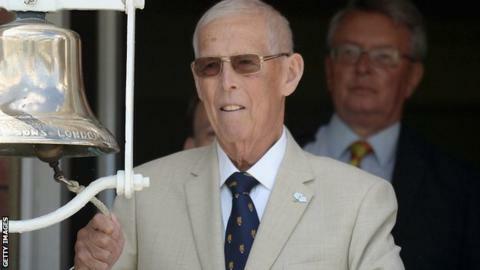 Yorkshire president John Hampshire has died, aged 76, after a long illness. The former Yorkshire and England batsman and international umpire scored 21,979 runs for the Headingley club. He was part of the White Rose side that won three successive County Championships between 1966 and 1968 and skippered the team in 1979 and 1980. Hampshire also became the first England player to score a century on their Test debut at Lord's when he hit 107 against the West Indies in 1969. Andrew Strauss and Matt Prior are the only other England batsmen to score Test debut hundreds at the home of cricket. Hampshire later had a spell with Derbyshire before ending his playing career in 1984, and went on to stand in 21 Tests as an umpire between 1989 and 2002. Chairman Steve Denison said: "John epitomised everything that's good about Yorkshire County Cricket Club. "Brave, talented and with a heart of gold he captained Yorkshire, scored a century at Lord's on his Test debut and became a highly-respected umpire after hanging up his playing whites." Former Yorkshire and England skipper Michael Vaughan described Hampshire's death as a "sad, sad day for Yorkshire cricket & world cricket". In a post on his Instagram page, he added: "John Hampshire gave me so much advice down at Abbeydale park in Sheffield ... always with a nice dry sense of humour ... he will be dearly missed but never forgotten."